As a student who started at Lancaster in October 2010, just as the underpass building works were starting, and who was then away on study abroad last year in the first year of underpass operation, I was looking forward to returning to Lancaster and using the underpass for the first time. To be honest, I’m a bit disappointed. It gets overcrowded at peak times, every noise reverberates like a pneumatic drill (in particular Loud Bus Guy and those ‘cool’ people revving their engines as they drive through), and one can’t help but wonder at the health impacts of spending any amount of time in a relatively enclosed area with all those petrol fumes and diesel particles wafting around.With all these negatives, one could be excused for questioning whether the time and money invested in refurbishment of the underpass can be justified – yes, it protects you from the rain (although it has flooded in the past), and saves the grass in front of the chaplaincy centre – but were the two years of construction worth it? 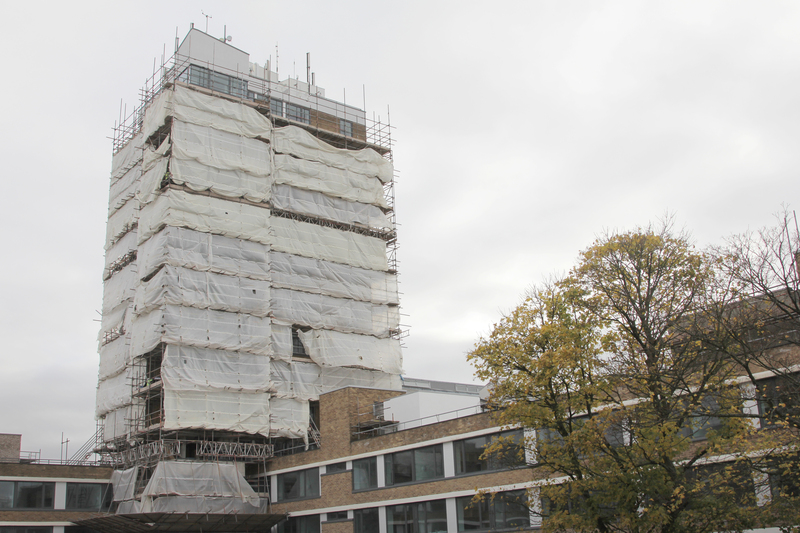 Even now the work on the underpass is completed, the refurbishment of Bowland Tower and construction of a new Engineering building are causing further headaches for students and staff alike. With rumours about the history of Bowland Tower still alive in student minds, is it wise to be refurbishing the tower for student accommodation? The myth that Bowland Tower was decommissioned after a series of students committed suicide by jumping from the roof was debunked in SCAN in 2012, with reports of only one case of a fall from the tower. As Daniel Hall reported, the tower was closed as it has not been refurbished since it was first constructed in 1968, and was therefore unfit for purpose. It is now being refurbished to provide accommodation for students from January 2014 – accommodation which is sorely needed after the embarrassment at the start of this academic year when almost 100 first year students were forced to live off campus as a result of misallocation of accommodation. The new accommodation in Bowland Tower is also expected to be more affordable for a student budget, with students saving almost £700 compared to the equivalent accommodation in other colleges – a huge benefit to students when rental costs continue to rise year on year. Similarly, construction of the new state-of-the-art Engineering building on the site of the old sports centre may be inconvenient and disruptive (particularly when trying to access parts of the Lancaster Environment Centre), but it suits a purpose – the engineering department has grown considerably in reputation, student and staff numbers have increased in recent years, and the original engineering building, dating from the 1960s, is incapable of supporting any further expansion. Hence the £12.25million development. The new building – a centre of excellence – will provide areas for future growth in nuclear, energy and chemical engineering, attracting both more students and more funding to the University. The head of the Engineering department, Professor Malcolm Joyce, has been quoted as saying that students would really benefit from the new working and learning environment and facilities. Indeed, this is surely the major benefit of the seemingly never-ending construction on campus – the investments are almost all for the benefit of the students and staff. An example of this is the sports centre – a £20 million development, at a university with no sports degree – evidence of investment in people. The erection of a wind turbine on campus also stresses the University’s commitment to sustainable energy practices. The turbine is expected to produce approximately 12% of the University’s electricity supply. This drive to promote the University’s green credentials is also evidenced in the new Engineering building, which is set to achieve a sustainability outstanding rating, raising the bar in regards to building efficiency in line with the University’s sustainability and carbon reduction targets. It perhaps should also be said that with so many top level universities carrying out refurbishment and new construction projects (such as the Universities of Sheffield, Bath and Edinburgh to name just a few), if we want to remain at the top of the league tables we need to maintain world class facilities, which necessarily depends upon constant building and construction on campus. So while the noise, pathway diversions and access issues may seem irritating and pointless at present, the benefits they will bring to the staff and students of the University in the future are priceless.